Physics Buzz: Happy Birthday, Laser! And My Mom! This week we celebrate the creation of the first working laser! And my mom's birthday! YOU GUYS DIDN'T FORGET DID YOU?! I almost did, and so I am, as usual, a little late getting these birthday wishes out. I did call/email/text my mom a whole bunch of times on her birthday to make her feel loved (which she is), but I haven't even called the laser yet and at this point the more I put it off the more awkward it is going to be so I should really just get it over with. HAPPY BIRTHDAY MOM! I LOVE YOU! I HOPE YOU LIKED THE FLOWERS! See, that was nice. But I don't know if the laser will get as much enjoyment out of the same gesture. He might realize that it actually falls under my job description to write about him here, therefore invalidating the idea of a "gift." I am sorry, laser, but you are so hard to shop for. Seriously, I cannot afford to buy you those 8-foot long Burberry scarves you like so much, they are WAY overpriced and some of us have to pay rent! Ugh, now I'm making it more awkward by yelling at the laser in his birthday post. But please, laser, take this post as my humble gift offering to you. It is only a tiny thing but it has a lot of heart. Hmmm....well, it looks like Nature has some nice pieces about the anniversary of the laser. OOoooooohhhhhhkay, I see, so when Nature does it it's a great gift?! Yeah, that's just great, lasers, that's just great. This is seriously not going well. What am I trying to do here? Give one of the greatest inventions EVER a birthday present on a blog? What do you get the physics invention that has everything? I mean, this is an invention that seems to get better every day?! Just this week, Nature Photonics featured a paper out this month from a group of researchers who may have solved (on a relative scale) the problem of laser wavefront distortion. In brief, when you shine a light through certain materials - like one of those frosty windows or, I don't know, wax paper - the light gets refracted and splintered off, which means you can't see through those materials because the light doesn't make it to your eyes before it's path is skewed. This can also happen due to disturbing factors in the environment. With enough knowledge about the system that is skewing the light, the researchers found they could begin to correct for the damage to the beam of laser light, or "sculpt" it back to new. This means they could keep lasers highly focused as they pass through difficult material - like your body. The team says they think the technique will assist in medical imaging, which is an area of constant concern as it is often used in disease detection. This description makes this process sound very easy, and that is mostly due to the fact that I don't understand it. But I am pretty sure that a lot of hard work and PhD's went into this. And you know what? 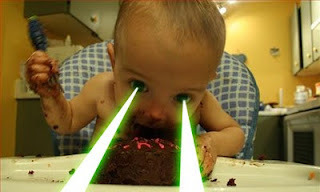 Even though I don't understand this paper, it has jut reminded me of something very important: THE LASER IS HUMAN, TOO. Lasers are flawed just like the rest of us. 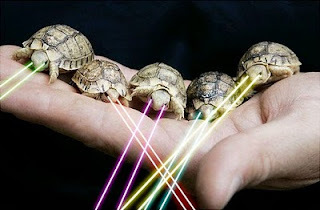 Laser, without the help of your family (physicists and engineers) you would not be able to exist the way that you do! It's not just that they gave birth to you, it's that they steered you and guided you and helped you keep things in perspective when they started to get fuzzy. They put a roof over your head and fed you and clothed you (just go with the metaphor). They gave you so much! How do you ever thank someone for that?! Try and try as you might, you can never fully pay them back! You can only take advantage of the many opportunities that they provided for you, and hopefully, one day, they will get to see you writing nonsensical rants on a blog that is supposed to be about science. Err....I mean, doing important laser things. Or whatever. You get my point, lasers. Yes, you are really awesome, but only because scientists and engineers believed in you! And when the rest of the world gets tired of CD players, and when cats stop chasing laser pointers, it will be the physicists and the engineers who find something else to do with you, some way to improve you, and make the world love you again. I am no physicist but I am a promoter of science, from its most basic level to its most crucial applications, and you are part of that, laser. So this blog might not look like much, but it represents our greater battle to promote science to the world. And that is a gift you can't put a price on. Unless you want to talk hourly rates. But I don't want this to get weird. So Happy Birthday, Mom and Lasers. I love you. In different ways.